^ Boris Abramovich Rozenfelʹd (1988). The history of non-euclidean geometry: evolution of the concept of a geometric space. Springer. p. 385. https://books.google.com/books?id=DRLpAFZM7uwC&lpg=PA385&ots=Zx5CHBJ9Lk&dq=%22On%20Quaternions;%20or%20on%20a%20new%20System%20of%20Imaginaries%20in%20Algebra%22&pg=PA385#v=onepage&q=%22On%20Quaternions%3B%20or%20on%20a%20new%20System%20of%20Imaginaries%20in%20Algebra%22&f=true. ^ Hamilton. Hodges and Smith. (1853). p. 60. https://books.google.com/?id=TCwPAAAAIAAJ&printsec=frontcover&dq=quaternion+quotient+lines+tridimensional+space+time#PPA60,M1. ^ Hardy 1881 pg. 32. Ginn, Heath, & co.. (1881). https://books.google.com/?id=YNE2AAAAMAAJ&printsec=frontcover&dq=quotient+two+vectors+called+quaternion#PPA32,M1. ^ Journal of Theoretics. http://www.journaloftheoretics.com/articles/3-6/qm-pub.pdf. ^ Conway, John Horton; Smith, Derek Alan (2003). 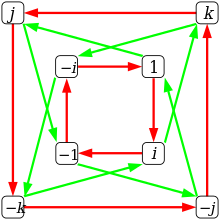 On quaternions and octonions: their geometry, arithmetic, and symmetry. p. 9. ISBN 1-56881-134-9. https://books.google.com/books?id=E_HCwwxMbfMC&pg=PA9. ^ Simon L. Altmann (December 1989). “Hamilton, Rodrigues, and the Quaternion Scandal”. Mathematics Magazine 62 (5): 306. https://www.jstor.org/stable/2689481. ^ Ken Shoemake (1985). “Animating Rotation with Quaternion Curves”. Computer Graphics 19 (3): 245–254. doi:10.1145/325165.325242. https://www.cs.cmu.edu/~kiranb/animation/p245-shoemake.pdf. Presented at SIGGRAPH '85. ^ Hamilton, Sir William Rowan (1866). 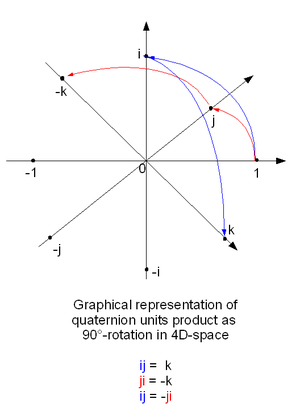 Hamilton Elements of Quaternions article 285. p. 310. https://books.google.com/?id=fIRAAAAAIAAJ&pg=PA117&dq=quaternion#PPA310,M1. ^ Hardy Elements of quaternions. library.cornell.edu. p. 65. http://dlxs2.library.cornell.edu/cgi/t/text/pageviewer-idx?c=math;cc=math;q1=right%20quaternion;rgn=full%20text;idno=05140001;didno=05140001;view=image;seq=81. ^ Vector Analysis. Gibbs-Wilson. (1901). p. 428. https://books.google.com/?id=RC8PAAAAIAAJ&printsec=frontcover&dq=right+tensor+dyadic#PPA428,M1. ^ Hamilton (1899). Elements of Quaternions (2nd ed.). p. 244. ISBN 1-108-00171-8. Hamilton, William Rowan (1853), "Lectures on Quaternions". Royal Irish Academy. Tait, Peter Guthrie (1873), "An elementary treatise on quaternions". 2d ed., Cambridge, [Eng.] : The University Press. Maxwell, James Clerk (1873), "A Treatise on Electricity and Magnetism". Clarendon Press, Oxford. Finkelstein, David, Josef M. Jauch, Samuel Schiminovich, and David Speiser (1962), "Foundations of quaternion quantum mechanics". J. Mathematical Phys. 3, pp. 207–220, MathSciNet. Crowe, Michael J. (1967), A History of Vector Analysis: The Evolution of the Idea of a Vectorial System, University of Notre Dame Press. Surveys the major and minor vector systems of the 19th century (Hamilton, Möbius, Bellavitis, Clifford, Grassmann, Tait, Peirce, Maxwell, Macfarlane, MacAuley, Gibbs, Heaviside). Altmann, Simon L. (1989), "Hamilton, Rodrigues, and the Quaternion Scandal". Mathematics Magazine. Vol. 62, No. 5. p. 291–308, Dec. 1989. Conway, John Horton, and Smith, Derek A. (2003), "On Quaternions and Octonions: Their Geometry, Arithmetic, and Symmetry", A. K. Peters, Ltd. ISBN 1-56881-134-9 (review). Kravchenko, Vladislav (2003), "Applied Quaternionic Analysis", Heldermann Verlag ISBN 3-88538-228-8. Ernst Binz & Sonja Pods (2008) Geometry of Heisenberg Groups American Mathematical Society, Chapter 1: "The Skew Field of Quaternions" (23 pages) ISBN 978-0-8218-4495-3. Vince, John A. (2008), Geometric Algebra for Computer Graphics, Springer, ISBN 978-1-84628-996-5. For molecules that can be regarded as classical rigid bodies molecular dynamics computer simulation employs quaternions. They were first introduced for this purpose by D.J. Evans, (1977), "On the Representation of Orientation Space", Mol. Phys., vol 34, p 317. Zhang, Fuzhen (1997), "Quaternions and Matrices of Quaternions", Linear Algebra and its Applications, Vol. 251, pp. 21--57. "Geometric Tools documentation" (frame; body) includes several papers focusing on computer graphics applications of quaternions. Covers useful techniques such as spherical linear interpolation. Patrick-Gilles Maillot Provides free Fortran and C source code for manipulating quaternions and rotations / position in space. 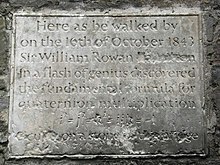 Also includes mathematical background on quaternions. "Geometric Tools source code" (frame; body) includes free C++ source code for a complete quaternion class suitable for computer graphics work, under a very liberal license. Quaternion Math and Conversions Great page explaining basic math with links to straight forward rotation conversion formulae. John H. Mathews, Bibliography for Quaternions. Andrew Hanson, Visualizing Quaternions home page. Charles F. F. Karney, Quaternions in molecular modeling, J. Mol. Graph. Mod. 25(5), 595–604 (Jan. 2007); doi:10.1016/j.jmgm.2006.04.002; E-print arxiv:0506177. Johan E. Mebius, A matrix-based proof of the quaternion representation theorem for four-dimensional rotations., arXiv General Mathematics 2005. Johan E. Mebius, Derivation of the Euler-Rodrigues formula for three-dimensional rotations from the general formula for four-dimensional rotations., arXiv General Mathematics 2007. NUI Maynooth Department of Mathematics, Hamilton Walk. Morier-Genoud, Sophie, and Valentin Ovsienko. "Well, Papa, can you multiply triplets? ", arxiv.org describes how the quaternions can be made into a skew-commutative algebra graded by Z/2×Z/2×Z/2. Curious Quaternions by Helen Joyce hosted by John Baez. Weisstein, Eric W. "Quaternion". MathWorld（英語）.